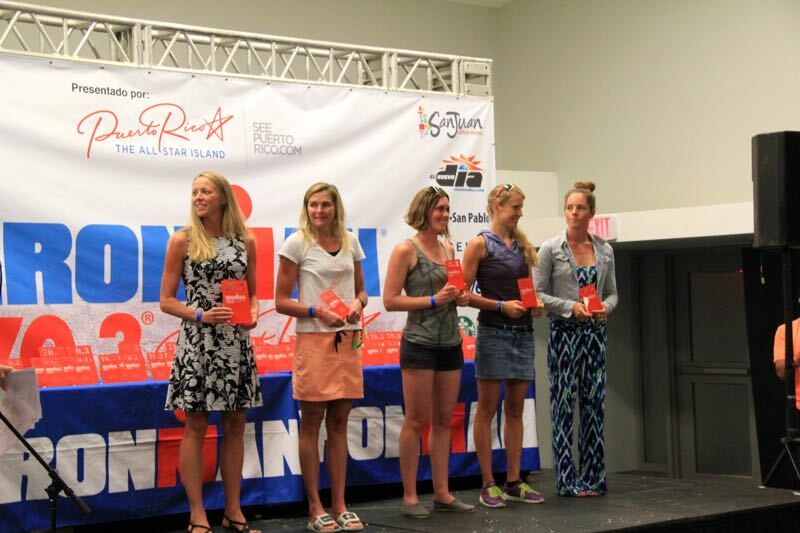 San Juan 70.3 March 15th, 2015. 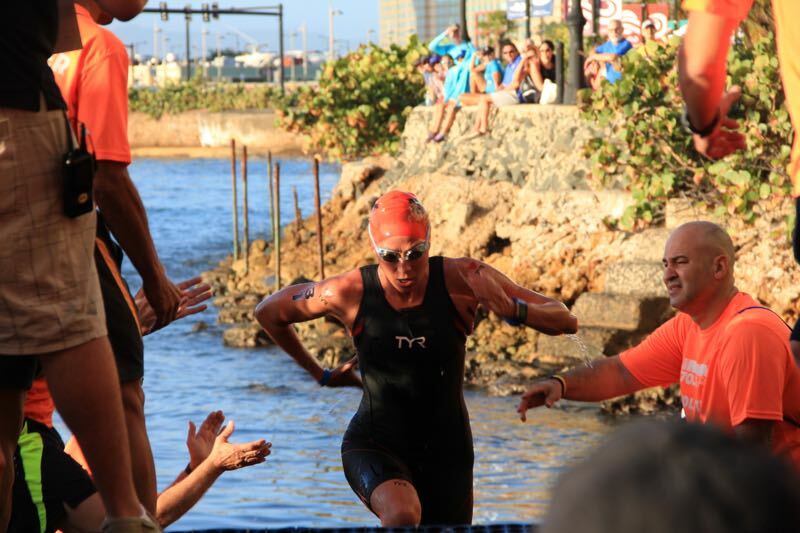 This past weekend I completed my first 70.3 distance in San Juan, Puerto Rico. Heading into the race, I had increased my volume a bit in my bike and run training, but I still wasn’t sure how it was going to feel putting all three together on race day. I was a little nervous about nutrition and hydration needs, but excited about stepping up in distance! The two days prior to the race had been windy, cloudy and cooler. I assumed we may luck out with some cloud cover; however, the sun was shining bright without a cloud in a sky! The swim venue was gorgeous with a calm, smooth and perfect 80 degree water temperature. At the 200 meter mark, I took over the lead in the swim, and focused on sighting, feeling smooth and not expending too much energy. With about 400 meters left to go in the swim, I felt my timing chip falling off, so I grabbed the chip and swam with it down my suit. 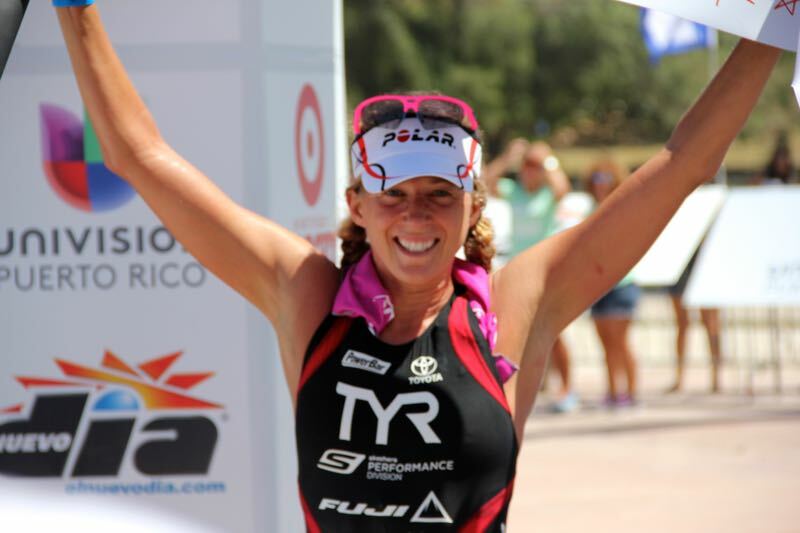 I excited the swim with about 45 second lead over second place. 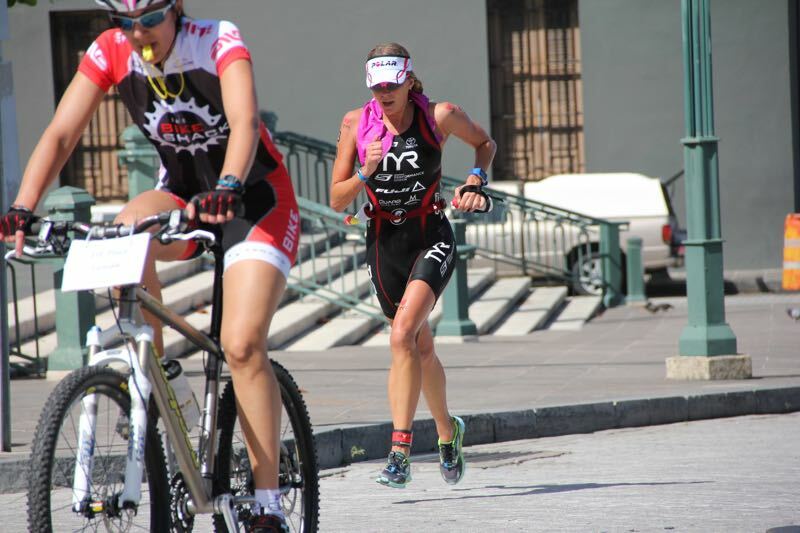 The first transition was a 1k run from swim to bike, including some running over cobblestones. I decided it would be best to put on running shoes for this transition, so I had some shoes just down the steps from swim exit. As I was headed out on the bike, race volunteers noticed that I was missing my chip. There was a slight delay before I was able to mount my bike, as I was stopped to get a new chip on my ankle (instead of in my suit). I am sure I was only stopped about ten seconds, but those seconds seem so long while racing!! The bike was mostly flat and fast. There were a few small risers going up and over the highway bridges. It took several miles to get comfortable on the bike. The first third of the bike, my quads felt a little tight. Once I made a u-turn at the far end of the course, I started to pick up my cadence and began to feel better with my cycling legs. On the second loop of the bike course, we were riding with the age group athletes. Most of the time, there was plenty of room to ride; however, I was not prepared for the aid stations. Trying to grab water while riding ( a new experience for me), but also trying to accomplish that amongst dozens of athletes of different abilities around you and water bottles dropping to the ground, was a little scary! Fortunately, the tires remained rubber side down! I began to feel some fatigue the last ten miles of the bike (which I assume is to be expected!). I focused on getting in enough fluids and fuel in preparation for the warm, humid and hilly run ahead! Here is my Quarq Powerful presented by Trainingpeaks. 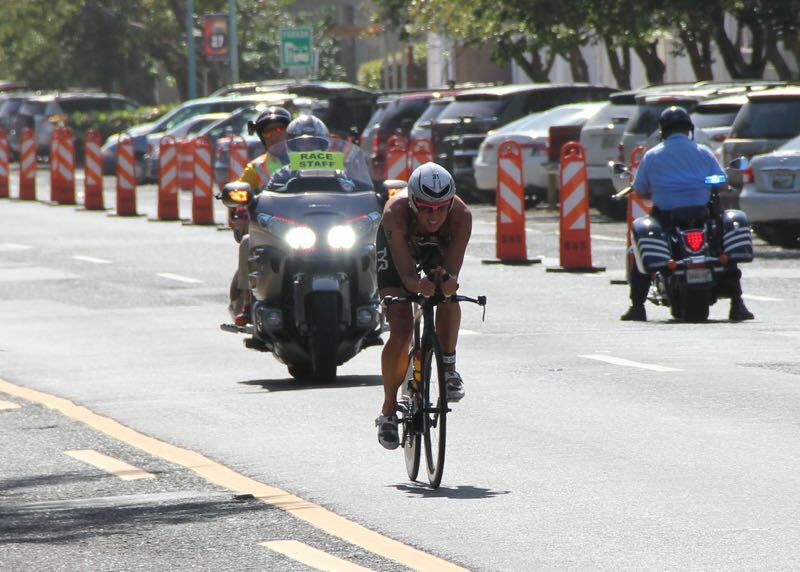 Exiting the bike into T2, my legs felt a bit heavy…and my hip flexors felt a bit sore. I started off the run with a much slower effort than my normal 10k “go hard from the start” speed. I knew the run was going to get warm, so I wanted to be smart in energy conservation. I was not sure how my legs were going to hold up at the end of the race. My main focus was to cool off at the start. I had my Mission Cooling Towel and around mile two, got to throw a big bag of ice down my suit. I also used my Polar V800 the entire race to monitor my effort during the race. You can relive the race here with my Polar V800 file. The miles started ticking off faster than expected. With all the hills, cobbles, ocean view and changes of scenery, the run course was going by very fast. It did not seem like I ran a half marathon!! Around mile ten, I felt a slight cramp after going around a u-turn, but recovered quickly and focused on grabbing electrolyte drink the last couple of miles. At the end of the race, I just started singing random songs, which is what I sometimes do at the end of my long runs….so I apologize to anyone who made have heard me! Just before the finish, we had to climb up one last short hill and then I got to break that tape! 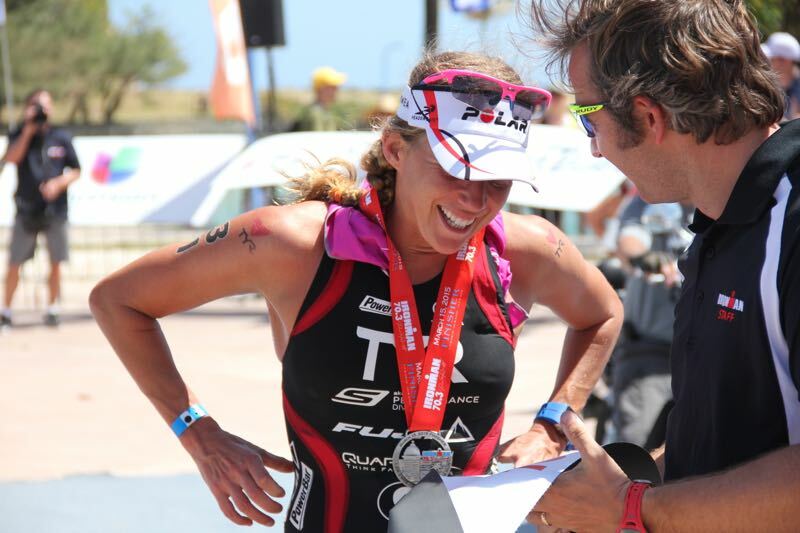 70.3 distance is a long way and getting to that finish line is an accomplishment for anyone completing that distance. I was thinking in the back of my mind the entire time, “I am going to be doing….double this distance in a couple of months?!!…what!!). I am excited for what is to come and push my body to meet those goals. Your body is stronger than you think!!! Thank you to all my friends, family and sponsors for supporting me. I am first going to recover, enjoy time with family and then train for my first Iron distance.